If you plan on visiting the MOMA then set aside some time to stop by The Modern...you won't regret it. Located on the street level, The Modern has a general public entrance so you do not actually have to have a museum ticket to enjoy this little delight. I first stumbled across this place when Mr. Z and I visited NYC to see Tim Burton’s exhibit last year after a grueling 24 hour flight from the other side of the world. We didn’t have any reservations and it was a very busy lunch so we sat at the bar where luckily the full menu was available. The food was suitably the work of artists both in presentation and in taste but what really seared this establishment into my mind was the beignets we had for dessert. 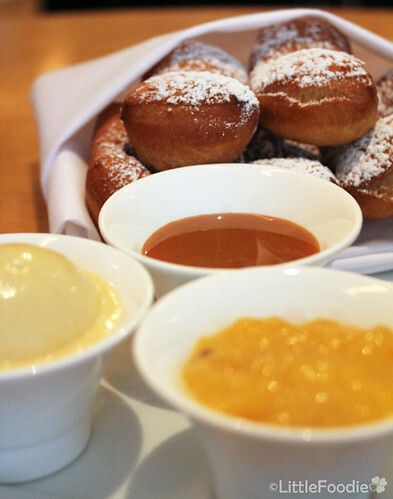 This little delight of deep-fried dough with a trio of maple ice cream, caramel and mango chutney was recommended to us by a fellow patron sitting at the bar who was clearly a frequent diner. And now I highly recommend to other future patrons. 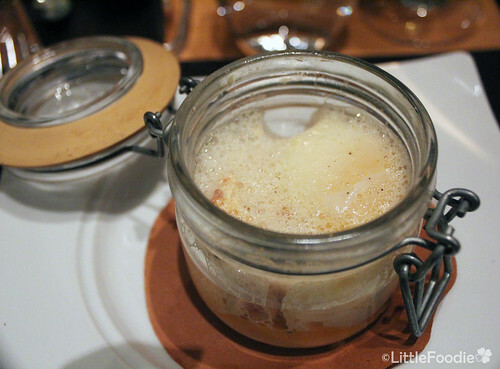 I started with the Slow poached farm egg in a jar as per the menu name with Maine lobster and a sea urchin froth. Does that not just sound divine? All I would need is a freshly baked brioche and this may make the ultimate breakfast. As I delicately tried to scoop up the egg, the slightly runny warm egg yolk gushes out to mix with the salty froth and smothers the bite-sized lobster flesh creating a creamy seafood infused sauce. To accompany I tried a very refreshing Lychee puree mixed with soda and embellished with slices of sugar caramelized ginger. 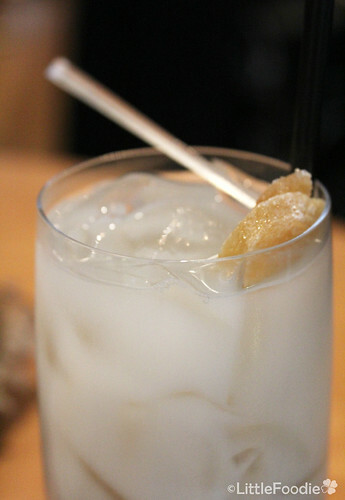 Naturally sweetened by the lychee and yet nicely diluted by the soda provides a great palate cleanser between dishes. 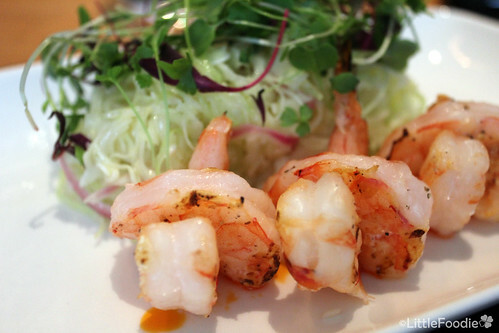 Mr. Z started with the Fresh grilled shrimp which came with a light cabbage salad. Although this is not a particularly unique dish it was nevertheless delicious. We shared four mains. 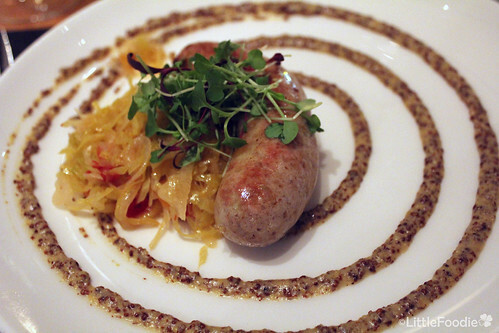 The first was a Homemade Alsatian country sausage which came with sauerkraut and whole grain mustard sauce. As you can see this is not the beer garden version but apart from the missing bear it was deliciously spicy and juicy. 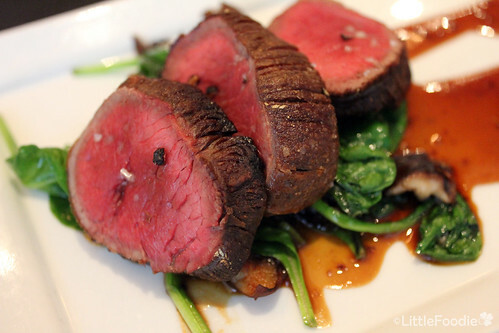 The Creekstone farm beef tenderloin with bread pudding, wild mushrooms and mustard jus was amazingly well prepared for those who like their meat on the rarer side as is my preference. Juicy, tender and lightly seasoned with the savoury sauce. Main downside of this dish was that the bread pudding accompaniment had absorbed the sauce as per design but the sauce leaned a little bit too much on the salty side. The Modern however is very accommodating and were very humble in their reception of my comments - a welcome quality in all restaurants. 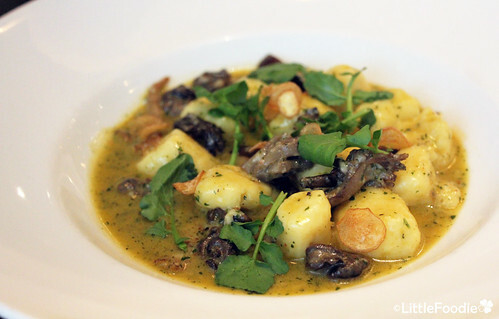 The Potato fromage blanc gnocchi with escargot wild mushroom and garlic was hearty wintery meal. A little bit soft on the outside but not overcooked. To finish I had to try their hot chocolate and even this was well presented. The drink itself was the typical creamy hot milk with a dash of chocolate (rather than what I consider "hot chocolate: - yes I'm a snob about this!) but it was at least not watered down. 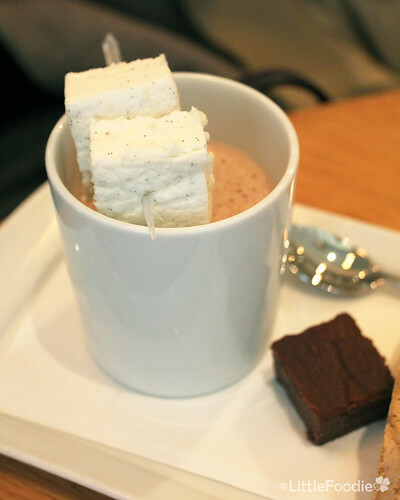 The marshmallows are presented skewered and slightly submerged so they are warm and partially melted pleasing both melted marshmallow lovers (Mr Z) and those who are just interested in the hot chocolate itself. The drink also comes with a little square of fudge brownie…which slightly made up for the lack of chocolate in the drink. And as this was the main draw card for my return we did not leave without our fulfillment of beignets. 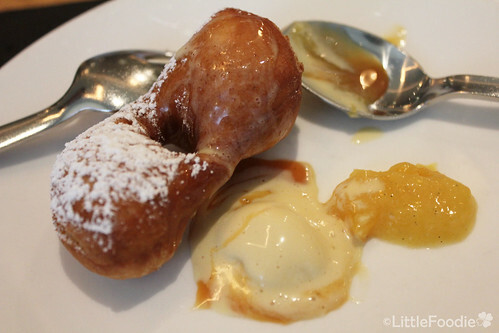 The warm freshly fried beignets, sweet sticky caramel, cool ice cream and the sweet and tart mango chutney did not fail us and was as good as the first time we had it. This is only one of two restaurants where I have seen beignets on the menu. I really love it and if anyone has suggestions where I can get some good biegnets I’m most happy to be directed. 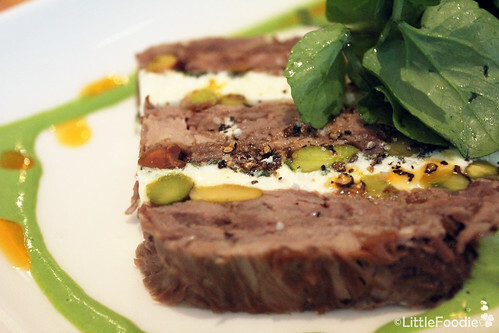 What I enjoy about the Modern is the presentation and the tiny servings the dishes come in allowing the diner a chance to better enjoy a greater variety of artistic food. I would highly recommend anyone visiting the MOMA to plan for a visit to the Modern for lunch…or if not then at least some beignets for afternoon tea. Food: Art that you can eat. 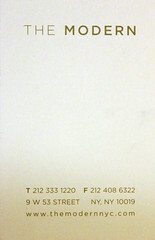 Service: Once again excellent service. Damage: $15-20 for small dishes and $20-30 for the larger dishes.